I love autumn, despite how unfortunately little I’ve experienced it, growing up in tropical Philippines and one-season wonder Los Angeles. I love the crispness in the cool air. I love seeing the leaves changing color. And then there’s this stirring, seeing the world before you change, how nature simply knows that soon it will be time to shed its old self, it accepts and celebrates this in a quiet show of subtle but tremendous beauty. When I’ve been lucky enough to catch fall over these years of travel, I just fall in love with it (sorry, I could not help the pun!). 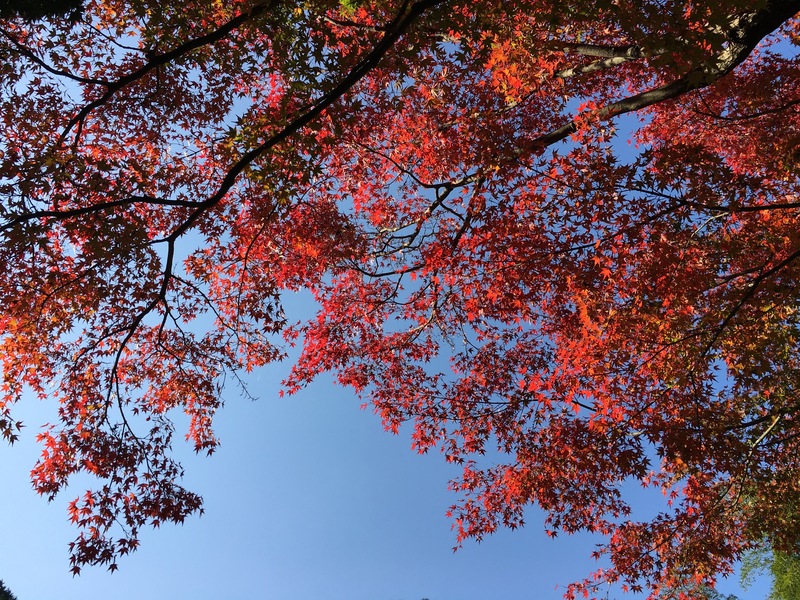 I was in Arashiyama, Kyoto last weekend with a girlfriend and we both found ourselves jumping excitedly as we saw the bold reds, oranges and yellows of the mountainside, which had been, not that long ago, a pretty uniform green. Autumn arrives here in Japan during a difficult week for both of my home countries. New regimes are stepping in to the highest seats of power and with them rhetoric and promises (some might call: threats) that is difficult to stomach and dangerous towards minorities. I have feel sad as a woman and as a first-generation immigrant, I worry for the safety and well-being of friends and family, particularly in post-election America. The changing trees, however, remind me that transformation is always at work. There will always be shifts. Summer is not forever, winter will most definitely come, and, when all seems lost, spring will soon follow. Everything in its good time. I don’t know how the world will change–though, I don’t plan on sitting idly and watching it all just happen. But when I see the autumn leaves, I’m excited by it because it reminds me of something essential about myself. There will always be this time, this time of letting go, and that somehow this way I move forward. This is when I regroup, I look at my stores, knowing that energy is precious and limited and that its my duty to find where it is best served. Our yoga practice likewise has its own seasons. Sometimes not quite in the same order, but sometimes very similar. The autumnal flow of practice is a pretty dramatic time, change is visible and tangible with the inescapable the feeling that we are at the end of something. We celebrate. Or mourn. There’s a great show before we huddle in for our deep internal winters, emerging when it’s time for spring. As I process the changing world around me, I return to the lessons on the mat, looking for equilibrium by standing on my own two feet, by breathing deeply through the feelings of separation and fear, by examining my expectations for a world that appears to be going in a different direction. I am asking myself how do I balance a need for calm and collected thoughfulness while acknowledging that my participation is needed in the world I want to live in. I don’t exactly know how, but I do feel that I’m equipped with a way to do it. One thing is for sure–and has always been a certainty–the world is changing and, like it or not, we will change with it.